The development of membranes started in the 1960s when the first water desalination plants based on RO technology were designed and built. But even a decade ago, membrane processes were still relatively unknown as a treatment technique. 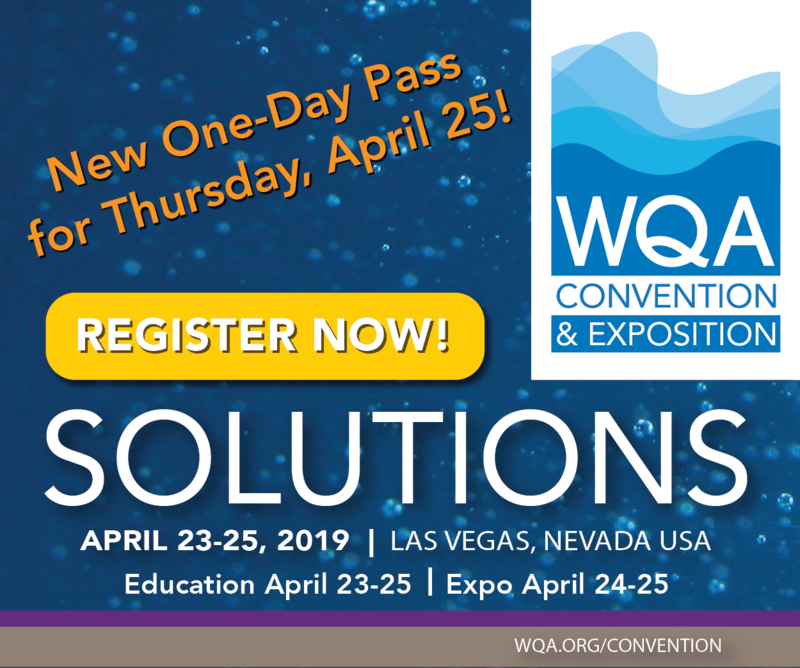 Increasingly stringent regulations have caused membrane processes to rapidly gain acceptance as a cost-effective method for water and wastewater treatment. Membrane technology is an established part of several water treatment processes. In response to increasing applicability, US EPA has recognized membrane processes such as RO as a ‘best available technology’ (BAT) for meeting a wide variety of the Safe Drinking Water Act (SDWA) regulations. It is therefore not surprising that membrane and module sales in 1998 were estimated at more than $ 4.4 billion (USD) worldwide, shared among different applications.1 Of particular interest, if you consider the cost associated with equipment and total membrane systems, the above estimation would probably be five-fold higher. 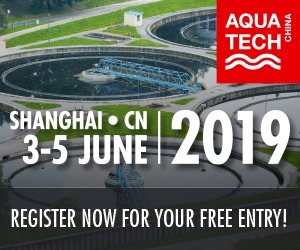 The characteristics of membrane processes, both current and emerging applications, and membrane process selection will be discussed. A description of the components constituting a membrane treatment train system for surface and ground waters will also be shown. 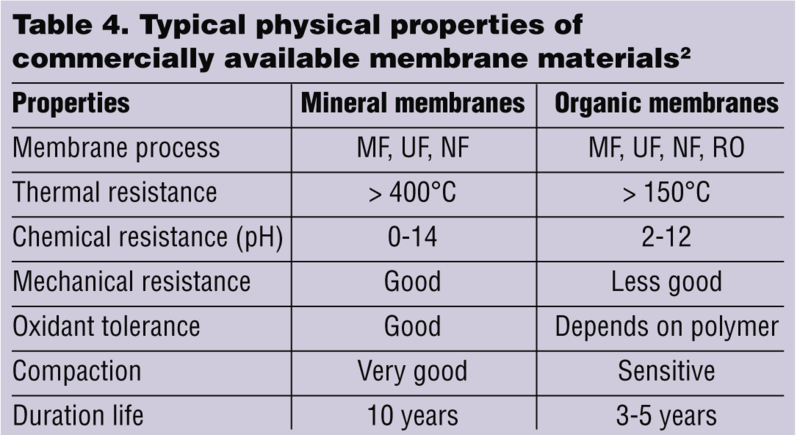 A membrane is a permeable or semi-permeable, solid phase (polymer, inorganic or metal), which controls the relative rates of transport of certain species present in the source waters and restricts their motion2-4. Generally, membranes work by selectively allowing some constituents to pass through the membrane while blocking the passage of others. For this to happen, the movement of material across a membrane requires a driving force. Therefore, membrane processes can normally be classified based on the type of driving force that causes components in the water to separate. The different type of driving force that initiates solute separation includes: a pressure differential (micro-, ultra-, nano-filtration and reverse osmosis); a concentration difference across the membrane which initiates diffusion of a species between two solutions (dialysis); and a potential field applied to an ion exchange membrane that initiates migration of ions through the membrane (electrodialysis, electro-electrodialysis and electrochemical devices). Membranes processes applicable to water/waste water are summarized according to the driving force (Table 1). Generally, membrane processes that use other driving forces (such as air stripping, evaporation, and/or distillation) have continually been found to be either very expensive and/or inefficient. 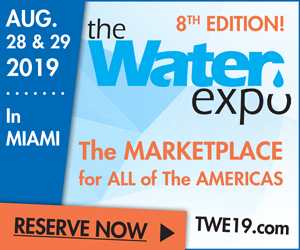 This has limited their application to commercial water and wastewater treatment, and this article will limit its discussion to membrane processes which have a wide range of applications in water treatment and waste water treatment. Membrane processes used for drinking water applications commonly use pressure as the driving force. 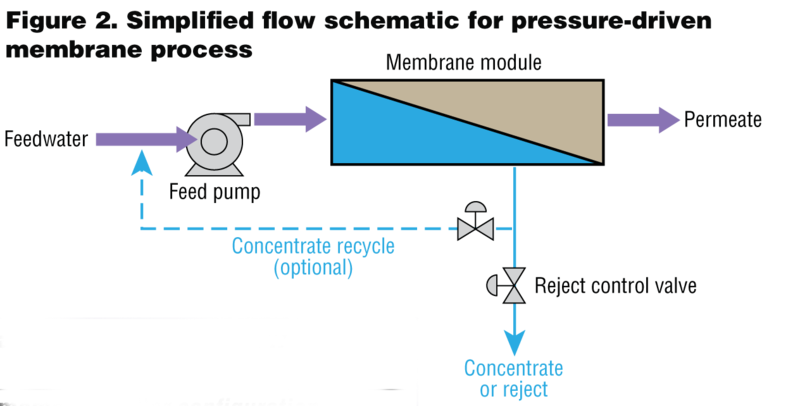 The four categories of pressure-driven membrane processes include reverse osmosis (RO), microfiltration (MF), nanofiltration (NF) and ultrafiltration (UF). RO and NF typically operate at significantly higher pressures than MF and UF processes and are typically deployed for the removal of dissolved inorganic and organic constituents. Low-pressure membrane processes (i.e., MF and UF) are typically applied for the removal of particulate and microbial contaminants and can be operated under positive or negative pressure (i.e., vacuum pressure). The selectivity between MF and UF is typically based upon pore size number (diameter of the micropores in a membrane surface) or molecular weight cut-off (MWCO) number. That number is the molecular mass of a macrosolute, such as glycol or protein, for which a membrane has a retention capability of greater than 90 percent. It is difficult to measure the true pore size of membranes. 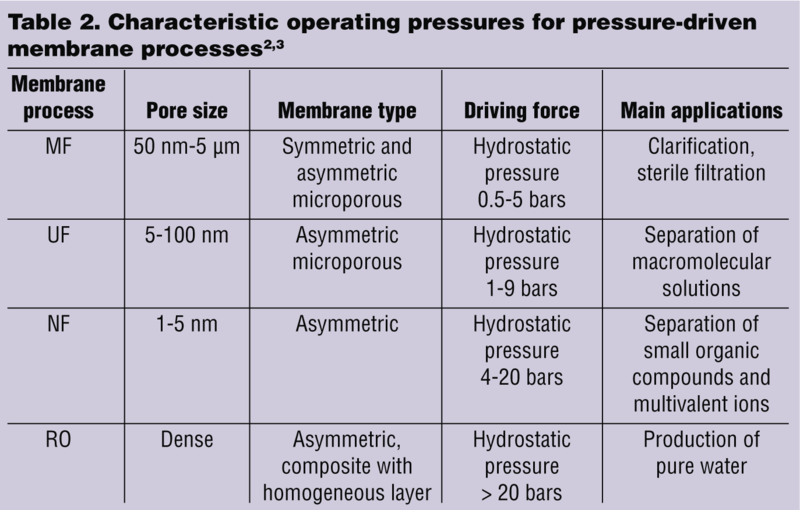 The absolute pore size is often characterized as the largest pore size in a membrane surface and has a minimum diameter above which 100 percent of a marker of a specific size is removed by a membrane. MWCO/pore size ranges for the membrane process, as well as the relative size of some common drinking water contaminants, (Figure 1 top) are compared to the species separation during pressure-driven membrane process (Figure 1 bottom). Pore size is an important consideration in determining which contaminants present in the water a MF or UF membrane process can remove. The relevancy of pore size to membrane performance is limited by the buildup of a cake layer on a membrane surface over the course of a filtration cycle4. For this reason, membrane exclusion characteristics are often assessed through challenge demonstrations that a given membrane type can reject a specific contaminant. The exclusion characteristic is a direct measure of performance and, as such, can be used to compare two different membrane. The pore size is an indirect measure of rejection capability. 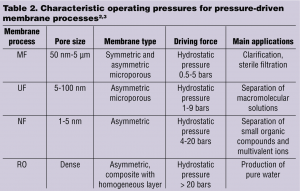 In water treatment operations, typical operating pressures are required to affect separation as well as main application of a given membrane process (Table 2). It is evident that RO requires the greatest operating pressure. This is because it has the smallest pore size range of all other membrane processes and has the ability to remove solids as small as salts. The reverse is true for MF and UF. 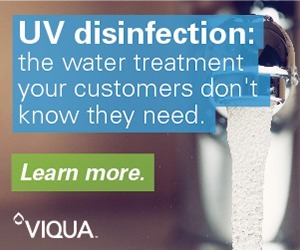 With the wide range of constituents that can be removed, the pressure-driven processes have many applications in municipal and industrial water treatment. Commonly used in water/wastewater treatment, a simplified flow schematic for the pressure-driven membrane process is most representative of RO and NF (Figure 2). Feed water is pressurized by a pump and passed across the membrane. A portion of the pressurized feed stream passes through the membrane and is collected as permeate (treated water). The remaining fraction exits the system as a concentrate (reject or brine). Due to the selectivity of the membranes, the permeate stream will contain a lower concentration of components (e.g., salts, colloids, particulates) and the concentrate stream a higher concentration. 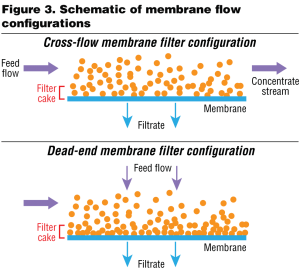 RO and NF typically use semi-permeable membranes and therefore, the solubility and diffusion rate of water in the membrane are much greater than for salts and other components in the feed stream. UF and MF typically employ simple membrane sieving. Some water treatment systems use vacuum-driven MF and UF systems, where the permeate is sucked through membrane systems that are immersed in process tankage. MF and UF system membranes can be operated in either a ‘dead-end flow’ or cross-flow mode. When operated in a ‘dead-end flow’ mode, there is no waste concentrate flow during permeate production, as all of the feed water passes through the membrane. This traps particles on the membrane surface until backwashing or chemical cleaning removes them. 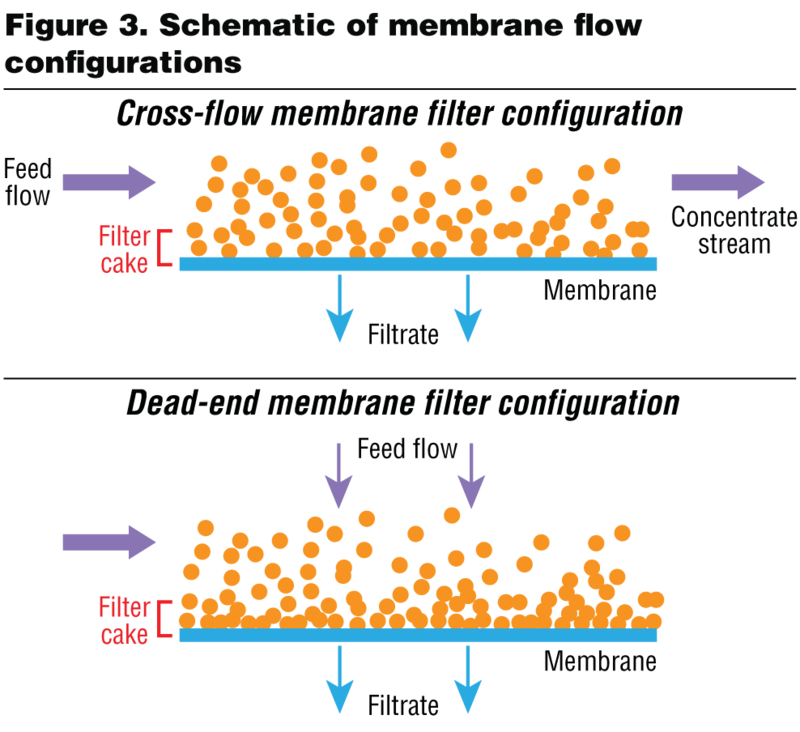 In a cross-flow mode, the feed water flows tangentially across the membrane surface, which is intended to enhance productivity by limiting the extent of particle deposition and cake layer formation on the membrane surface. In order to achieve a significant product water recovery, it is necessary to recirculate the concentrate from the membrane process. This typically requires additional pumping and, thus, can substantially increase operating costs. (Figure 3 comparison). Electrically driven (ED) membrane processes, commonly used in water/waste water treatment, also include electrically driven reversal (EDR) membrane processes. ED and EDR use a difference in electrical potential to induce dissolved ions to migrate through a water-impermeable membrane. This reduces their concentration in the feed water. (Figure 4). 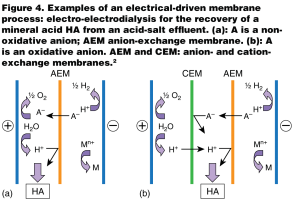 When voltage is applied across the electrodes, a DC current is induced that causes cations (positively charged ions) to move in the direction of the negatively charged electrode (cathode). The cations are transported through the cationic membrane but are restrained at the surface of the anionic membrane. The anions (negatively charged ions) move in the direction of the positively charged electrode (anode) and are transported through the anionic membrane, but are restrained at the surface of the cationic membrane. The end result is a ‘dilute’ stream with a reduced salt concentration and a concentrate stream with a higher salt content than the feed water. In operating ED, the direction of current flow is always the same whereas EDR requires the reversal of direction of current flow several times an hour. This is normally achieved by reversing the voltage polarity applied to the electrodes that produces a change in the direction of ion movement. Through alternating pairs of membranes, this causes an electrical flushing of scale-forming ions from the membrane surfaces. This periodic flushing controls the formation and buildup of scale and often allows the EDR process to operate at higher permeate recoveries with no or reduced dosages of scale-inhibiting chemicals as compared to ED. Almost all of the membranes that are applicable to municipal water treatment are prepared from synthetic organic polymers (either cellulosic or non-cellulosic membranes). The cellulosic membranes are usually asymmetric (made of one material but with a dense ‘barrier layer’ and porous support), whereas non-cellulosic membranes are either asymmetric or composites (barrier and support layers made of different materials). ED and EDR use synthetic polymers consisting of either cross-linked sulfonated copolymers of vinyl compounds (cation transfer type) or cross-linked copolymers of vinyl monomers with quaternary ammonium anion exchange groups (anion transfer type). 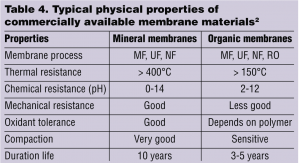 MF and UF membranes are made from a wide variety of materials, most commonly including polypropylene, polyvinyl difluoride (PVDF), polysulfone, polyethersulfone and cellulose acetate. The various membrane materials have different properties and characteristics such as pH, surface charge, and hydrophobicity. This can affect the exclusion characteristic of a membrane. Water and wastewater treatment polymer membranes are typically prepared in two forms, namely flat sheet and hollow fiber (capillary). With the exception of cellulose triacetate and the DuPontTM polyamides, all of the RO and NF polymer-types are normally ‘cast’ in flat sheets onto woven or non-woven backing materials. Flat-sheet castings are made in either one or two steps. Polyamide membranes are formed by casting a base membrane first (typically polysulfone) onto which the polyamide is cast in a process called in-situ polymerization. The two-step process allows for optimization of membrane properties by keeping the rejecting layer very thin to maximize productivity. Most commercially available MF and UF membranes currently used for drinking water treatment are made in a hollow-fiber configuration. Hollow-fiber membranes are operated in either an inside-out or outside-in mode. Membranes designed for RO and NF systems commonly use the flat-sheet polymer membranes, most commonly assembled into a spiral-wound module (element or cartridge). Membranes are wound around a central permeate core tube and a flow spacer material, which is commonly placed in between. Spiral-wound elements are placed inside a pressure vessel in a series arrangement (Figure 5). Typically, hollow-fiber membranes are bundled in groups of several thousand, potted in a resin on both ends, and housed in a pressure vessel, or module. Both pressure-driven hollow-fiber membrane modules, as well as a vacuum-driven hollow-fiber membrane module, are designed for immersion in process tankage. ED and EDR flat-sheet membranes are typically assembled into stacks. Each stack consists of up to 500 membrane pairs with a single pair of electrodes. The flow path reversal of an EDR membrane stack is accomplished as the polarity of the electrode pair is switched from positive to negative. Most importantly, membrane processes must be selected that will best satisfy the treatment objective(s) at the lowest possible cost. 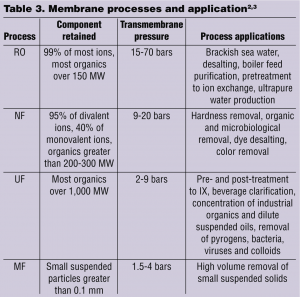 For pressure-driven membrane processes, the choice of membrane is dictated by both the physical properties of the membrane and the treatment goals2-3 , or by requirements for potable or ultrapure water production, TOC removal, or hardness reduction. The membrane process commonly used for most water and wastewater treatment operations is based upon the component retained and the transmembrane pressure. (Table 3). As previously mentioned the choice of membrane process is also dependent on properties of the membrane. 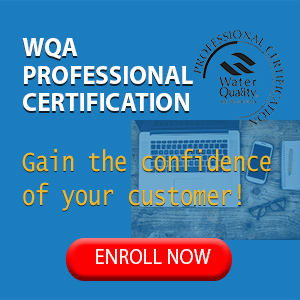 Therefore, choosing an appropriate membrane type for a given water treatment system also involves evaluation of the membrane physical properties. (Table 4). 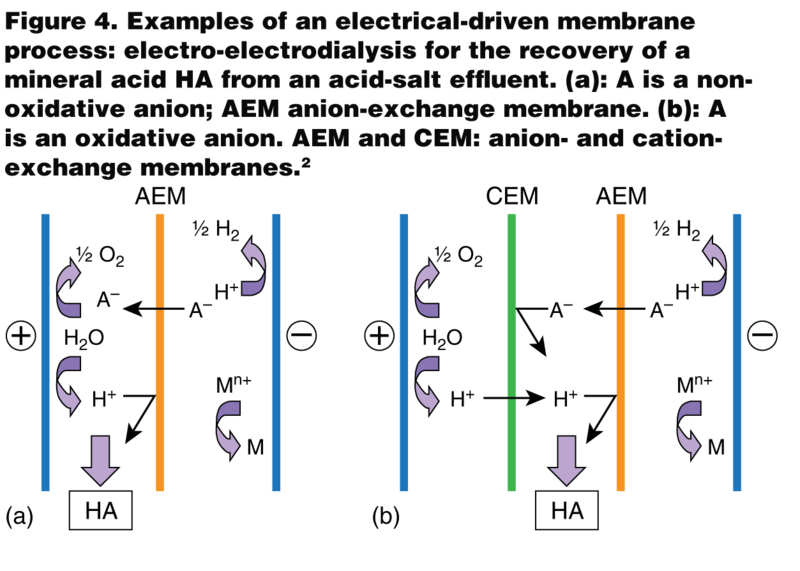 Generalized membrane process selection is a simplified method using typical criteria (Figure 6). As a word of caution, these criteria should not be applied to every situation without more detailed analysis. 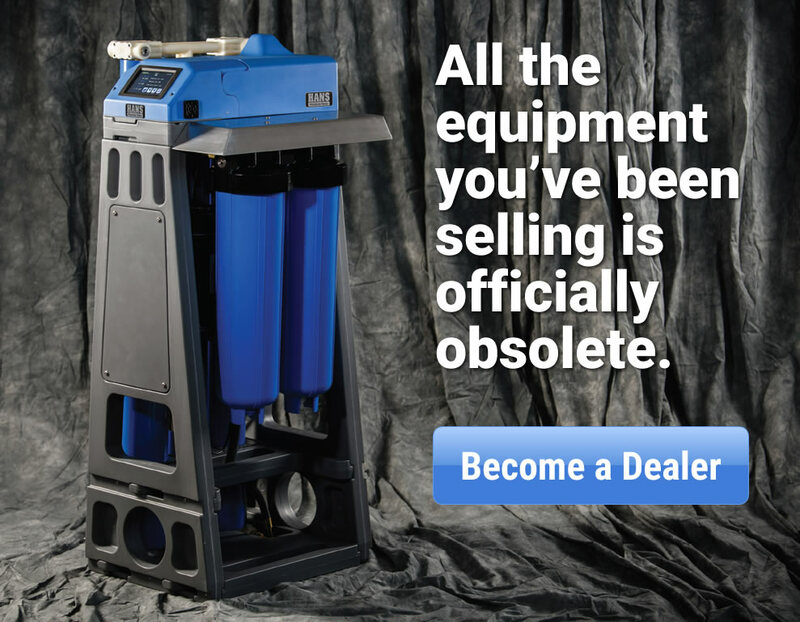 Reverse Osmosis and Electrodialysis traditionally have been used for TDS reduction, RO for both seawater and brackish water desalting and ED for brackish water desalting. More recently, both technologies are being applied to the removal of specific inorganic ions. Both RO and ED plants can remove high concentrations of naturally occurring fluoride from deep groundwaters. These plants incorporate raw water blending to meet treatment objectives while minimizing facility costs. RO is also being used to remove nitrate from contaminated groundwater. 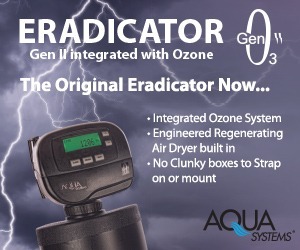 US EPA has classified RO (and to a lesser extent ED) as a BAT for removal of many of the contaminants listed under Phases II, III, and V of the 1986 SDWA Amendment regulations, including inorganic contaminants (IOCs) and radionuclides. RO has also been found to be effective in removing specific synthetic organic contaminants (SOCs) from contaminated groundwaters, such as herbicides and pesticides. Nanofiltration is currently used as an alternative treatment method to lime softening for reducing the level of calcium and magnesium in hard waters when TDS reduction is not a primary goal. The NF process is more effective than lime softening for removing naturally occurring color and dissolved organic species responsible for the formation of trihalomethanes (THMs) and other DBPs regulated by US EPA. NF is being used almost exclusively in Florida for this purpose. In many of these facilities, NF permeate is of higher quality than desired and is blended with raw water to reduce required treatment capacity as well as post-treatment costs. 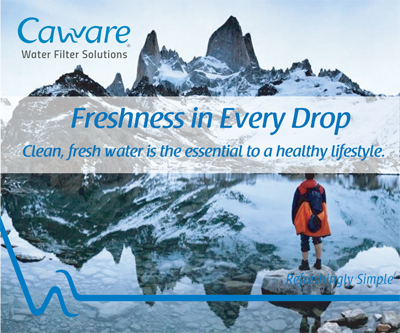 Microfiltration and ultra filtration are being used increasingly for particulate removal in order to comply with the Surface Water Treatment Rule (SWTR) and the Enhanced SWTR (ESWTR). 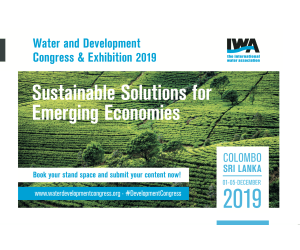 The processes have been shown to be cost competitive with conventional treatment-based approaches to comply with these regulations while providing additional advantages (finished water turbidity independent of source water quality, smaller footprint, reduced residuals and operating labor.) Applications are increasing due to the robust removal of both Giardia and Cryptosporidium protozoan cysts (>5 log), as well as reliable production of filtrate turbidities less than 0.05 nephelomatic turbidity unit (NTU). 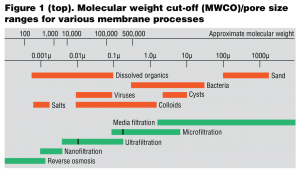 Microfiltration and Ultrafiltration can also be preceded by pretreatment systems to precipitate or co-precipitate dissolved inorganic and dissolved organic compounds for effective rejection by the membrane filtration system. For instance, we performed groundbreaking work for the City of Albuquerque related to contending with the new arsenic rule that recently went into affect, which significantly lowered the arsenic MCL level to 0.010 mg/L. Ferric chloride coagulation and in-pipe flocculation accompanied with carbon dioxide addition to maintain the pH of coagulation near neutral allows effective co-precipitation of arsenate and subsequent removal across the membrane. This process is cost competitive with ion exchange for arsenic removal and does not result in a waste residual that is classified as a hazardous waste. The type of membrane treatment process typically depends on the type of source water (ground or surface water). The relationship between each of these sources and typical membrane process and system train configuration requires comparative analysis. Desalting using NF, RO, ED: Groundwater is generally low in suspended solids, organics and other potential membrane foulants. Its use as a membrane feedwater usually permits the use of all membrane types (cellulosic and composite) and configurations. Spiral-wound membranes are most commonly used because membrane replacements can be competitively procured. Hollow, fine-fiber elements are also used, but to a lesser extent. Groundwater is best suited to the use of composite membranes in that they can take advantage of low-pressure requirements, low oxidation potential, and minimal pretreatment requirements (minimal chemical treatment). 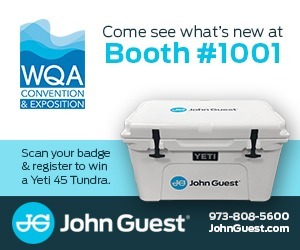 It may typically contain dissolved gases such as hydrogen sulfide and possibly CO2 in a typical process flow scheme for a groundwater supply. (Figure 7). MF and UF are applied to groundwater that is either under the influence of surface water and require treatment for microbial control, or contain high levels of iron and/or manganese and oxidation and filtration are required. 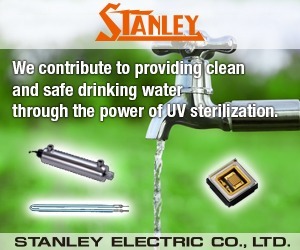 In this case, pretreatment consists of self-cleaning strainers. 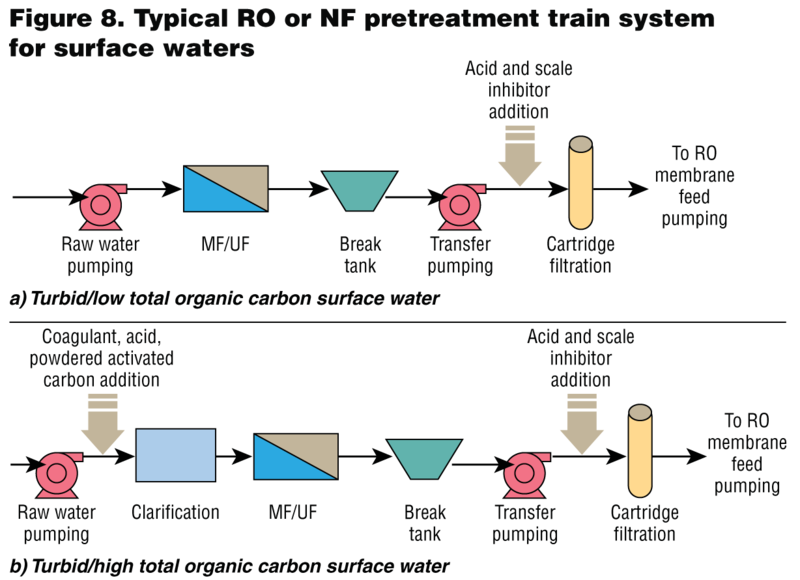 RO and NF pretreatment. Compared with groundwater, surface water almost always has higher concentrations of suspended solids, colloids, dissolved organics and microorganisms. In the past, prior to the advent of MF/UF systems, conventional filtration or softening/filtration were the RO/NF pretreatments of choice. 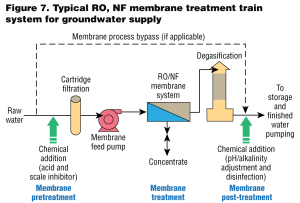 However, MF/UF pretreatment is becoming the preferred RO/NF pretreatment for surface water due to the consistent production of lower turbidity RO/NF feedwater that reduces membrane fouling at a given flux rate or alternatively allows a higher flux rate at a given chemical cleaning frequency. MF and UF treatment. 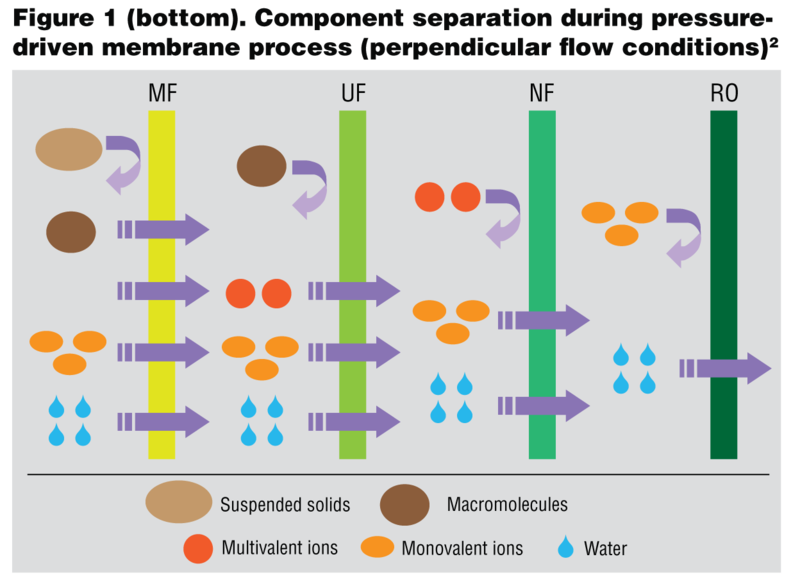 MF and UF membrane flux and fouling rates are impacted by the presence of suspended solids and other contaminants in surface water (e.g., organic material and iron). Suspended solids and other contaminants can result in more rapid fouling of the membrane, decreases in flux and increases in transmembrane pressure (TMP). As a result, most MF/UF membrane filtration systems include some level of pretreatment to remove suspended solids and other contaminants from the feed water. Typically, pretreatment includes 300- to 500-micron straining, at a minimum. MF and UF membrane treatment processes are effective for the removal of particles and microorganisms, as previously presented. However, these treatment processes are generally not effective for removing dissolved materials present in water sources, including TOC, arsenic, color, or undesirable taste and odor compounds, such as methylisoborneol (MIB) and geosmin. Removal of these contaminants typically requires a chemical or physical treatment process in addition to membrane filtration. Removal of TOC, DBP precursors and color-causing compounds may be achieved through coagulation, flocculation, or full chemical clarification prior to membrane filtration. Coagulation with ferric salts, followed by MF/UF, has been shown to be a viable method to remove arsenic. 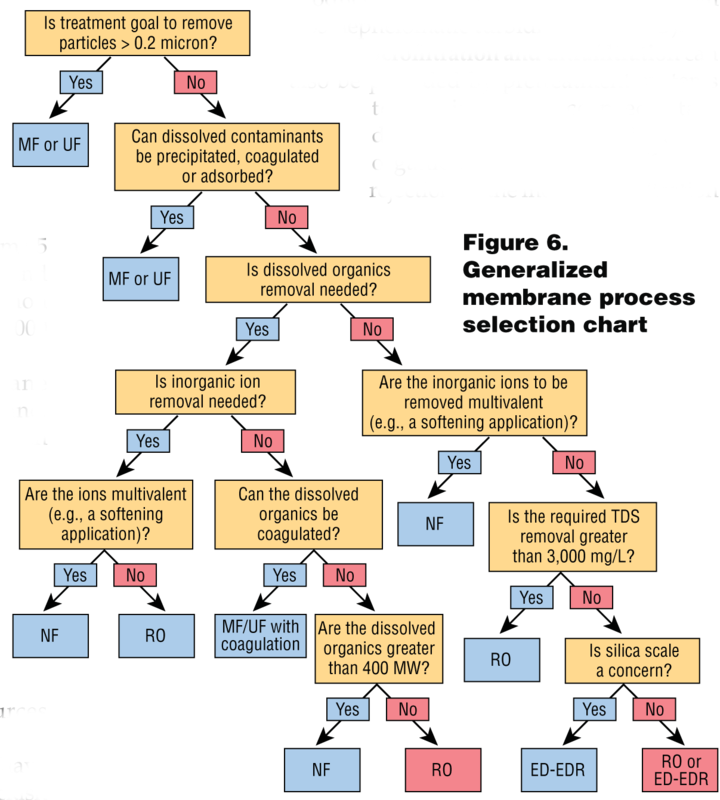 Some MF/UF membrane processes may be used with powdered activated carbon to absorb taste and odor compounds and, as indicated before, coagulation or full clarification can be used with some membrane processes to remove TOC. Studies have shown that even small reductions in TOC prior to membrane filtration can have a significant impact on membrane fouling rates. An integrated membrane approach is often a typical RO/NF installation. (Figure 8). Dr. Mo Mukiibi is a Water and Wastewater Treatment Engineer with CH2M Hill, Inc.’s Water Business Group, based in Tempe, AZ. His technical expertise ranges from advanced water and wastewater treatment to process control and water system design. Dr. Mukiibi is a technical expert (water and sanitation) for the World Health Organization (WHO) and is skilled in desalination technologies, concentrates management and disposal. 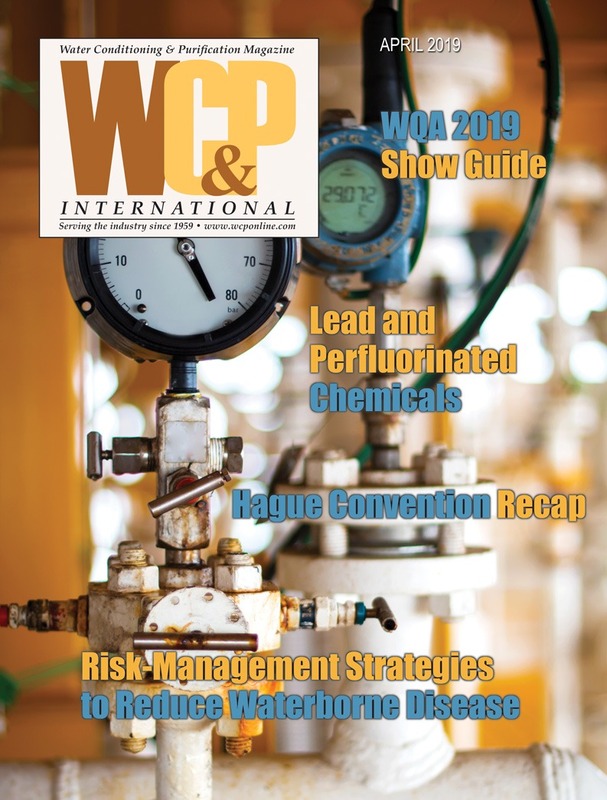 Well-published and with presentations offered at many conferences locally and internationally, Dr. Mukiibi is a member of the WC&P Technical Review Committee, an active member of WEF, NGWA and AWWA. He can be reached via phone (480) – 966- 8188 ext 38228, or by email at: mmukiibi@ch2m.com. Strathmann H., Membrane processes for sustainable industrial growth, Membrane Technology, 113, (September), 9-11, (1999). Mukiibi Mo. Reverse Osmosis – Challenges and Opportunities, 2008, (cover article). WC&P, Issue 50, No 11, November 2008.